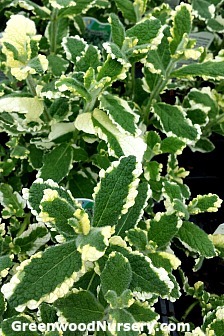 Pineapple Mint, with its variegated green leaves with creamy frilly edges, will add a wonderfully light pineapple scent to your garden. Plant pineapple mint in containers surrounding your patio or on your deck. As with most mints, it is an aggressive grower and you will want to contain it by planting it in pots or boxes. Promote new bushy growth by snipping your pineapple mint plant regularly. White to pink blooms will appear during summer on your Pineapple Mint, mentha suaveolens 'Variegata', attracting bees, hummingbirds and butterflies. Use Pineapple Mint in your desserts, fruit salads, summer drinks, hot teas, iced teas, and jellies. Try out this pineapple mint mojito recipe with your Pineapple Mint leaves. Pineapple Mint ships in 3.5 inch pots. Please note: Cannot ship to ID, MN, NV, UT, WY. Plants shipping to CA or AZ will be root washed before being wrapped for shipping.